Motorcycles are one of the most dangerous vehicles to drive on road. According to statistics “motorcyclists are 35 times more likely to experience a deadly accident” than those driving cars. This is why it’s illegal to make calls, smoke or do extra activities while driving a motorcycle. Sure, a full-faced helmet with a heads up display that keeps showing up stuff on the display is not dangerous at all. Well, except the fact that it is. 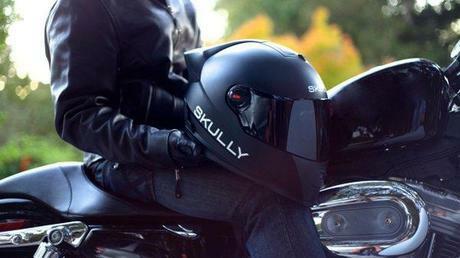 Skully P-1 is a high-tech helmet with a heads-up display that gets powered by Android. It has a micro-controller and a read-view camera to allow its’ wearer to look behind without turning their head. As it turns out, founder of Skully, Marcus Weller himself has been in a very bad accident while riding his bike, which has happened while he was trying to read a road sign. Apparently, that gave him this idea to invent this helmet, so you won’t have to read road signs again, according to Engadget. This helmet features GPS mapping, smartphone integration, 180 degree wide angle rear-view camera, voice control and more. Not sure if you can play Angry Birds on it while riding the bike, but it sure seems like very dangerous. While Skully promises to provide safety with better strength for helmet, it doesn’t say how much of a distraction it could cause the rider. As a motorcycle rider myself, I know how important it is to ride safe on the road. I also know enough to imagine that this type of a gadget could only cause you trouble.